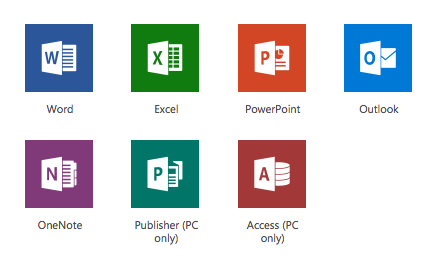 All staff and students are entitled to free installs of Microsoft Office whilst they are a part of All Saints' Academy. Microsoft Office 365 is a collection of web and device based applications that seamlessly integrate to allow you to work on the go or from the comfort of your own home on the device of your choice. You are able to install all of these applications onto a total of 5 unique personal devices. Publisher and Access are Windows PC only applications, whereas all the others can be used on Windows, Mac, Android and iOS. In order to take advantage of Office 365 staff/students need login to the web portal (https://admin.microsoft.com/OLS/MySoftware.aspx) and download the installer, click here for more details. To access the web-based applications navigate to portal.office.com and login with your Academy email and password. Once logged in you will see all the applications available to be used online, these include Word, PowerPoint, Excel and many others. One key application available is Microsoft OneDrive which is cloud storage available to every staff member and student. This allows you to store your files online, meaning they are available from any web enabled device. Simply save work at home to your OneDrive and continue working on that file(s) inside the Academy without the need to transport it via usb or email it back and forth to yourself. For more information on OneDrive please click here. When you leave the Academy, you will no longer have access to a licensed copy of Office 365 (this includes web-access) unless you join another educational establishment that offers this service. Alternatively, you can purchase Microsoft applications online or at a retail outlet.